I made this card last night and tried to write a post about it this morning, but my eyes were being held open with toothpicks, and I was out of Cokes. My little dude woke up hungry at 2:45 (he’s usually an all-night sleeper), so I was a littlelot sleepy. It’s crazy how you can handle being up twice a night when they’re first born, but once they’ve slept through the night for a couple weeks, you suddenly can’t deal with one wake-up. Jennifer Timko has a great sketch up at Freshly Made Sketches. I loved the sketch when I first saw it, and then I went through about five stamp sets and ALL THE COLORS before I finally made a card I was happy with. You ever have one of those days when you feel like The Most Creative Person in the World, and then everything you create with your amazing creativity is just blah? That was me yesterday. 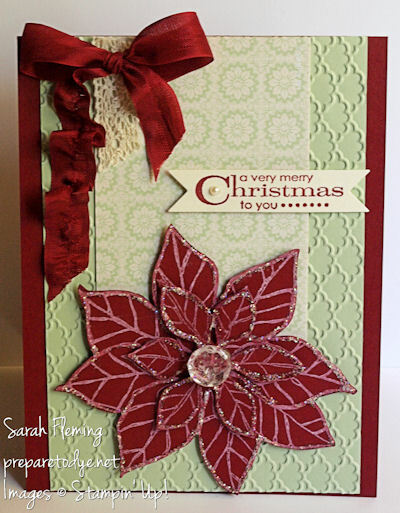 The poinsettia is from the Joyful Christmas stamp set (now available!). I stamped it in Whisper White Craft ink on Cherry Cobbler cardstock. I did this twice. I cut out the first image, then cut out only the middle petals on the second image, then popped the middle flowers up on dimensionals to have a 3-D flower. I outlined both layers with Dazzling Details glitter glue. After it dried, I added the button in the center using glue dots. I’ve been wanting to try Pistachio Pudding on a Christmas card, so I was really happy when I saw that the Venetian Romance paper has this lovely Pistachio paper with a flower that makes a passable poinsettia. It’s nice when things come together like that. The bow might be my favorite part of the card. First off, I hardly ever get my bows to look that nice. The Seam Binding ribbon is pretty cooperative, but you need to leave a little extra on both ends, because when you work with it, it frays easily. So leave room to cut off the frays after the bow is on your card. To get that gorgeous gather, I grabbed a thread in the center of the ribbon tail, pulled, then worked it out, pulled again, worked it out… over and over until the whole tail was wrinkled. If you’re playing along at home, just be careful not to let go of the pulled thread until you’ve gathered the whole thing. The sentiment is one of my all-time favorite Christmas stamps, from the More Merry Messages set. I usually add a little pearl or rhinestone to the middle of the C; it just seems like something should be there. The new holiday catalog is live today! 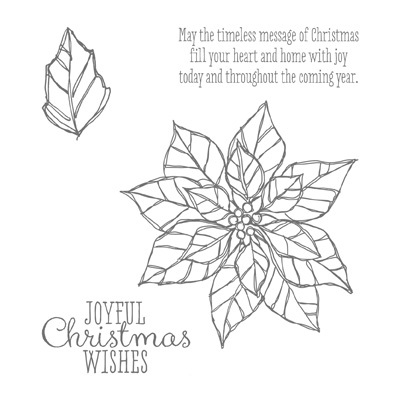 Here is a PDF of the catalog, or you can browse it in my online Stampin’ Up! store. 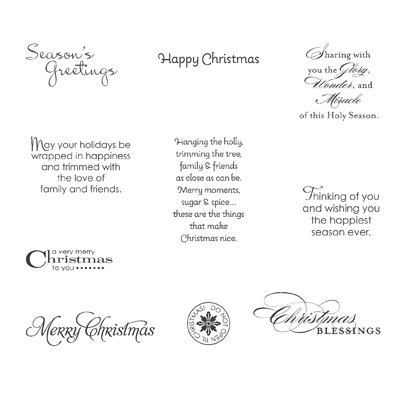 Also new and available to order today: Circle Card Thinlits dies and Label Card Thinlits dies! I almost peed my pants when they revealed these at SU!’s convention (so it was almost as exciting as when Dave Matthews Band played “Ants Marching” at my first DMB concert, *ahem*). 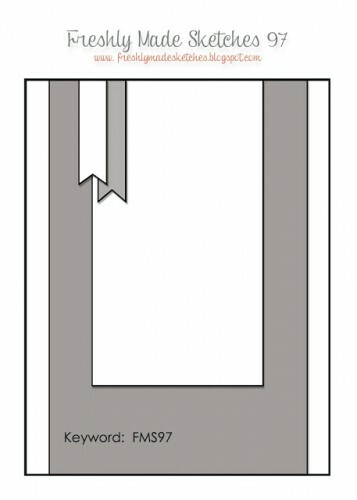 You can make a flip-flop card with no hassle — just use these Thinlits with your Big Shot, and cut and score your card in one step! So easy. You also get extra dies — various shapes and words — with each one. I’m ordering mine today and can’t wait to start playing! See all the details on my promo page at the bottom. I hope you enjoyed my card. Have a great day, and prepare to dye! Very pretty! Pistachio Pudding looks great on a Christmas card. Your bow is beautiful! Thanks for joining us at Freshly Made Sketches this week! This is really, really pretty! I can’t wait to get that flower and your colors are wonderful! Glad you joined us this week at FMS! Thank you, Jen! I loved your sketch!